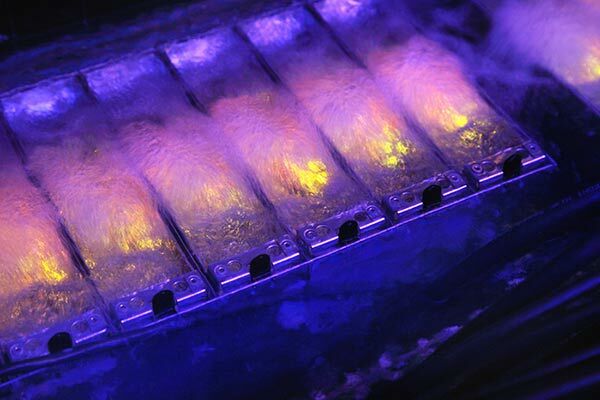 SGI and Intel have announced that they have been exploring a new cooling technique for data centre servers where the electronics are submerged in a special dielectric fluid developed by 3M. 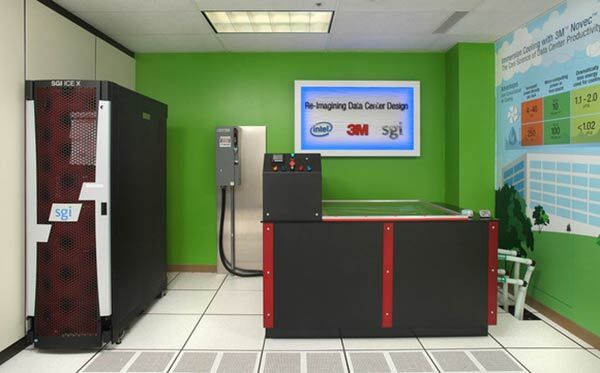 A fully functional proof-of-concept distributed memory supercomputer named SGI ICE X, which utilises the two-phase immersion cooling technology pioneered by 3M was showcased by the companies yesterday at a 3M office in St. Paul, Minnesota. It's kept cool by submerging the Intel Xeon processor E5-2600 board directly in a fluid called 'Novec', a dielectric liquid that allows electronics to be submerged in it whilst they continue to tick along normally. With Novec already being used in fire suppression systems, the technology is now being tested as a better cooling system for computers by surrounding the hardware in the fluid. Novec efficiently absorbs heat, keeping the CPU and other components at a constant temperature. It also reduces water consumption needed for evaporative cooling and cuts energy usage by 95 per cent all whilst increasing supercomputer efficiency at the same time. The technology is also said to require 10 times less space than conventional air cooling, enabling up to 100 kilowatts of computing power per square meter which could lead to a smaller environmental footprint. However, there are still several challenges which need to be overcome before the technology can be put to use, including designing new motherboards and servers that can accommodate it - as server designs are traditionally made to maximise the flow of air over components and immersion cooling is a completely different concept. "It's an opportunity and a problem at the same time," opined Michael Patterson, senior power and thermal architect at Intel. SGI has already lined up customers to try out the technology and said it will be experimenting with new computer designs based upon feedback, according to Bill Mannel, SGI's general manager of compute servers. Other companies specialising in immersion cooling with Novec include Intel's other full-immersion design Iceotope and Allied Control's systems in Asia in a data centre in Hong Kong. If the immersion cooling techniques can be improved by Intel, SGI and 3M and they work out a way to scale the costs in line with traditional systems, it is highly likely that we will start seeing higher adoption of immersion cooled data centres. I'd love some kind of “module” using this with a consumer cpu on it. With the right lighting the boiling fluid etc would look pretty cool (no pun intended). Certainly more impressive than the pumps and hoses of a normal w/c setup (to my mind anyway). I wonder how easy it is to hot swap a damaged disk in a RAID array? I can't imagine that anyone intends to submerge them, so can't see it being much different to the current situation? Can't recall the specifics but don't hdds ride on a cushion of air hence couldn't be submerged. The technology doesn't really seem that new tbh people have been putting PCs in fishtanks with cooking oil for years now lol.